If you’ve been searching for a way to navigate games without using your mouse and keyboard GiMeSpace CamControl Gamers Edition is the perfect solution. This application lets you navigate your game by moving your body in front of your webcam. You can move left, right, forward and backward, as well as turn in any of these directions. Also, the program lets you adjust the camera input to improve its accuracy. 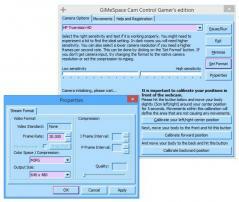 Also, GiMeSpace Cam Control Gamers Edition was designed to run using low system resources so your game performance won’t be affected.